This Black Grid Gondola Unit will sell your merchandise in a flash! The classy look of the unit paired with your beautiful display will make your customers come running! The included caster makes it easy to reposition your gondola anywhere in your store. Accessorize with shelves, brackets, Faceouts, peg hooks, Hangrails and many other grid accessories, all of which can be purchased separately through Store Supply Warehouse. Bases are also sold separately for use with your existing wire grid panels. 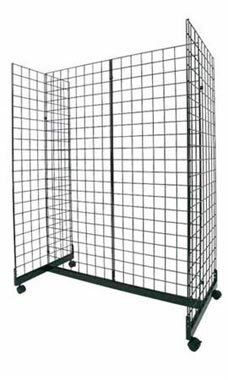 Dimensions of this unit are 48"L x 66"H x 24"W, this unit includes (4)2' x 5' Wire Grid Panels; (9)Wire Grid Connectors and (1)Gondola Base with Casters. All of our products are backed by a 110% Low Price Guarantee. In stock and available for shipping immediately. The first day I used it, it paid for itself. I have it configured so that the middle two panels are in the back. It fits around my table perfectly. I haven't used the wheels because of this change. The one change I would make is the weight of each grid. many more crafters would use these grids if they were lighter to carry. I used the grids without the base and was really impressed. The only thing I would change is the weight of the grids. Too heavy! The Black Grid Gondola, Is Great!! Easy to use and assemble. Looks great! Received my unit pretty fast. The only problem I had was it did not come with instructions. I called the company and they gladly sent them to my email. Once the unit was up I was very please with it. I going to order an additional one. Thank you. This rack is so versatile! I can change the grids to use higher ones, hang items from 6 areas, add shelves or baskets. I can't wait to use this! Did not include instructions, or a note telling me that they could be viewed online, however with the directions only being 1 page, don't see why it wasn't included.Directions were poor however and did not explain thoroughly how to put it together.Might be manufacturers fault but had to force some pieces to work as well. Great for areas with employee or customer movement. This display is easy to build and adjustment around your store. I have not used the base of the gondola so this review will be for the grid only (I will submit a review for the base after I use it-which could be a while). I am very pleased with the solid build of the grid. I made it into a square and was able to stand it on the ground with no problem of it falling over. I would reorder the grid if I need more in the future. I give the grid five stars. I love that this grid can be moved around (with the casters) and that the panels face all sides. My artwork can be viewed from any direction. This was easy to put together and holds quite a few items. Item came next day after ordered - great service. I was and I continue to be extremely pleased with this item as well as with the service I received. There shipping was VERY fast and all items came without a flaw, if we needed to call them they were very helpful in explaining things to us. The folks at Store Supply Warehouse have gone well above others with there service. As a new store we found that service to be an example as to how we should serve our own customers. Because we have purchased many items and have been very happy with all of them you will see this same review on all our purchases. These are going to be great for displaying art in our gallery. The rollers will make it easy to change displays. This rack is heavy duty. It's sturdy and well made. The casters roll well. The only reason I didn't give it 5 stars is because the directions to put it together were not with the unit and I had to look them up on line. Had I not been near a computer, that would have been very inconvenient.